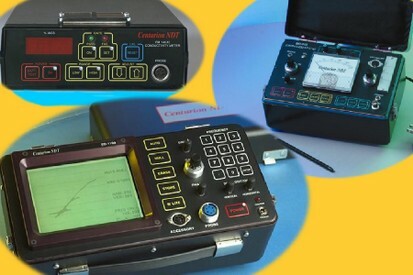 Centurion NDT, established in 1992, designs, manufactures and services a well known and accepted line of portable eddy current and ultrasonic instrumentation. Eddy current instruments such as the Model ED-520Me Eddy Current Meter and FM-140XL Conductivity Meter are well known and have been written into many aviation specifications. When testing high pressure aluminum cylinders, the Visual Eddy Test System in the only instrument on the market to accurately differentiate critical cracks. All instruments in the product line are engineered, manufactured and serviced in Streamwood, Illinois. Centurion NDT's business philosophy is to supply reliable, well engineered test instruments which are easy to use and economical to own. So easy to set up and easy to use makes the ED-1100 a top choice for aircraft wheel bead seat inspections using differential wide scan probes. See the Wheel Probe List for the most extensive bead seat probes in the industry.